Great summary of the case! I first learned your name from Jerome Clark's work, and heard your interview on Binnall of America. I plan on returning to your blog again. Thank for reminding us of this case. I was around when the story broke and I remember some of the skeptics put forth the idea that he may be faking to do a book deal. This was when his father was frantic over his missing son. When he didn't reappear they said he was flying upside down. Many people don't understand that this attitude toward a UFO witness or in this case the family inexcusable,. In this example he had his dead son reduced to a fraud or a fool just because of what happened. This is done all the time with hardly a word. Remind you of any group lately. There was also an incident in (if I remember correctly) the Nullabor Desert where an Aboriginal mother & her children were followed by a bright light and then their car was lifted up by its roof and dropped again. The family were rescued from near their wrecked car and there was significant physical evidence (damage to the roof and evidence that the car had 'fallen' onto a flat desert). After a week of media flutter, it all died down and I don't recall hearing any more about it. 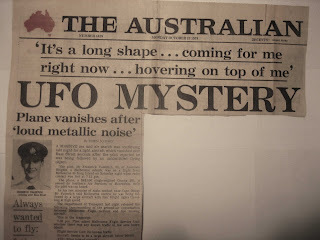 Australia has had a lot of really odd, similar occurrences. 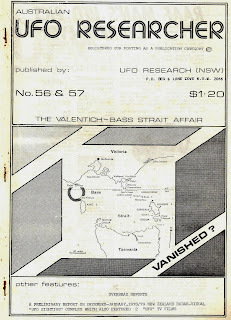 Wasn't there also a guy that took some photos of the sunset from Cape Otway on the same day as planes disapperance and recorded a strange shape in one of them? Masha Allah Your post was very informative.